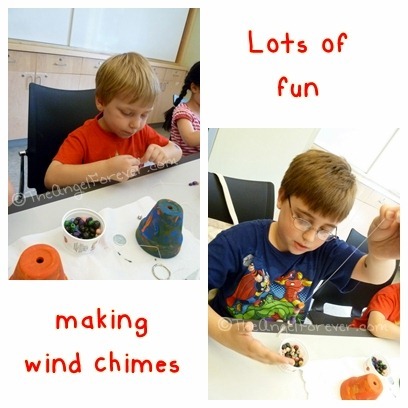 This week we went to the library for one of their summer projects. 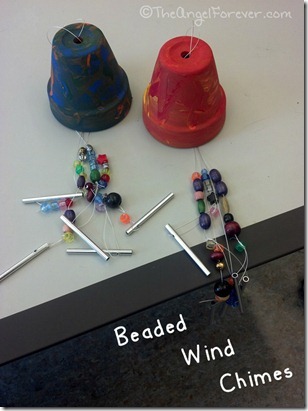 They were going to make wind chimes and it was a two part project. We had to sign up for it since they only had supplies for so many people. When we arrived, all of the supplies for the painting day were set out for project. 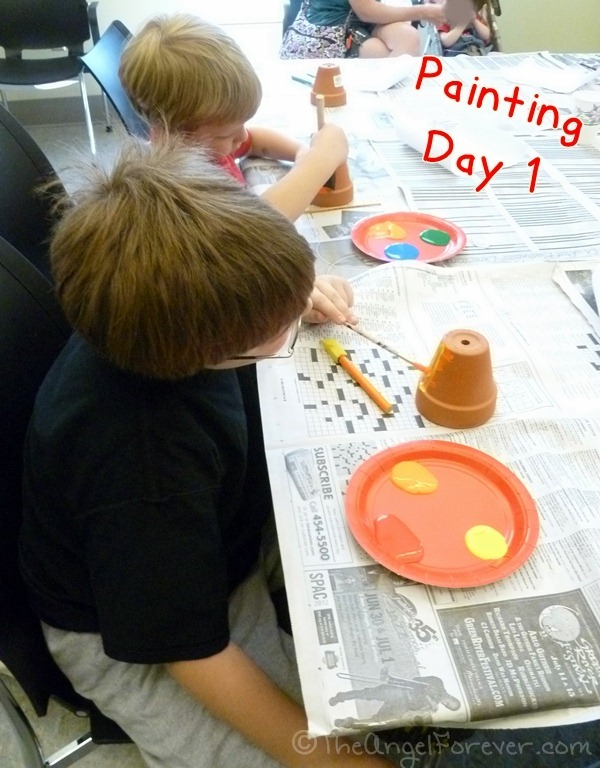 You had paint brushes and small terra cotta pots. 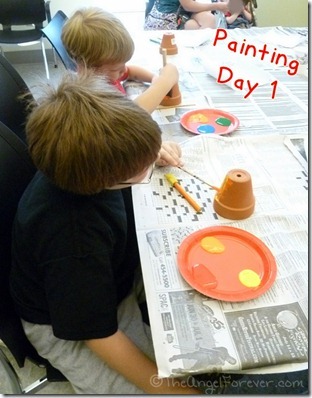 The librarian explained that you would be painting these on the first day. Lots of paint options were set out for people to select from. NHL, you wanted all warm colors. Your selections were red, orange, and yellow. JSL, you immediately wanted blue and then gold. The gold was not working right, so you opted for green and yellow. It was fun watching your techniques. JSL, you wanted to cover the entire pot in one color and then add some stripes and dots of another. NHL, you were going for a more bold tie-dye effect. 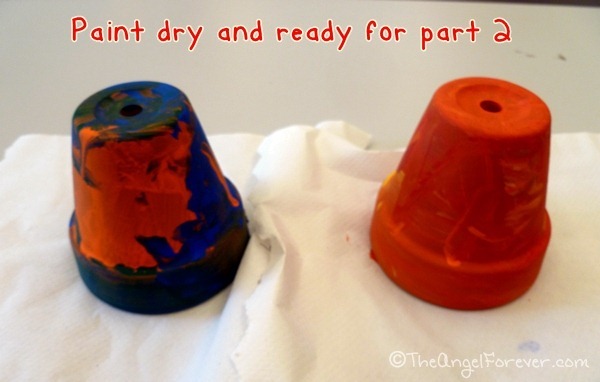 Both of you were done rather quickly, so we brought the clay pots to the room for them to dry over the holiday. Since the next step was VERY time consuming, the librarians helped you out. They had baggies set up with fishing line attached to a bead and the chimes at the end. There were five of these, the clapper (which was missing a string), key ring circle, and latch to hang up your creation. 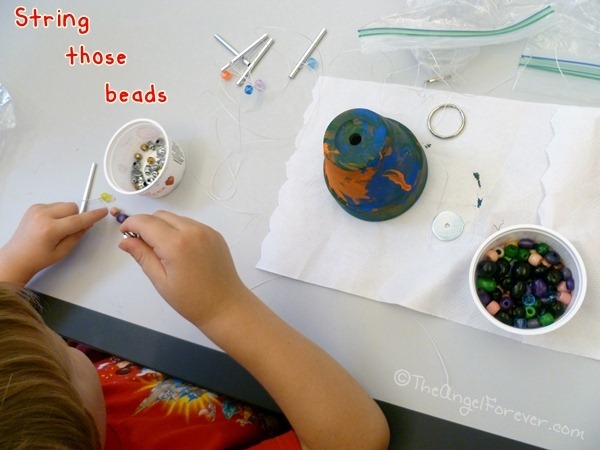 Both of you had a lot of fun creating all of your beaded sections. While you worked on those, I tied them onto the key ring. We had to leave the clapper off since it was getting knotted up with the string they had left. Not a big deal since the chimes and beads were producing a nice sound on their own. Now we just need to figure out where to put the wind chimes. I think we may get some hot glue to make the key ring stay in place. 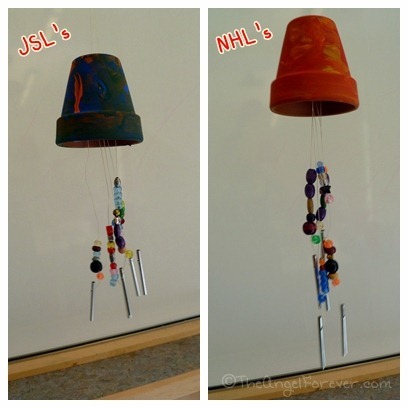 It was a lot of fun to make a new craft with both of you during a summer fun event at our library. I can’t wait to see what we do next time. Where did you get the chimes for this project?